During the summer of 2016 I took an interest in the concepts behind neural networks and machine learning and after doing researching I decided to apply my newly acquired knowledge. Recently I've begun working with TypeScript quite a lot and decided to stick with it as my primary language of development with Node to run the app. 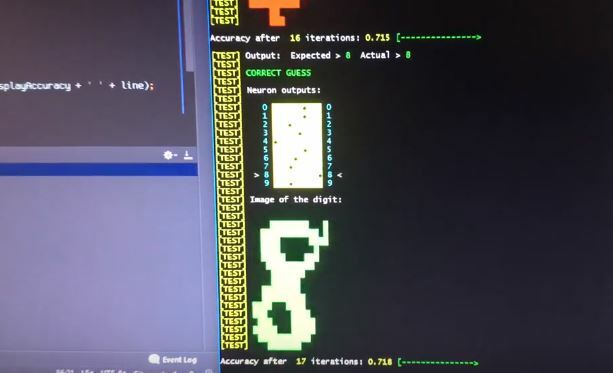 The final product was a reasonably complex neural network implementation with a working digit classifier, which reached the maximum accuracy of 81%. This is far from human digit recognition accuracy of 97.5% but the whole project was still a very useful exercise that helped me broaden my knowledge of machine learning. You can find the source code of the project on this GitHub page. I tried to document all of the TypeScript code so if you yourself are interested in neural network you might find it useful to look through the code. Below is a video of the digit classifier in action. In the video you can the output of just one of several testing scripts included in the repo, you can find more information about it by following the link above.